I hoped to avoid American fast food temptations on this trip. Asia has such an abundance of delicious cuisines to offer, why would I ever walk into a fast food chain for something I can get back home? Well, thanks to the lack of option in JB Sentral station in Johor Bahru, I was forced to line up at the KCF in Malaysia for breakfast. First of all, I didn’t even know that KFC served breakfast, in Malaysia or the U.S.. This was probably very naïve of me. I also didn’t know that there was KFC in Malaysia, which was also naïve because in this country, where most of the inhabitants are either Muslims or Hindus, chicken is the meat of choice. I also didn’t know that KFC would have unique offerings for Malaysia. I should have known better because I’ve been tracking McDonald’s unique offerings all over the world, and I fell in love with KFC in Seoul the first time I visited in 2007. Well, KFC Malaysia is in its own class of deliciousness. For breakfast I ordered the Chicken Porridge, a delicious congee with fried chicken, friend onions, green onion, and spices. It was seriously more delicious and more sanitary than any congee you will find on the streets here. 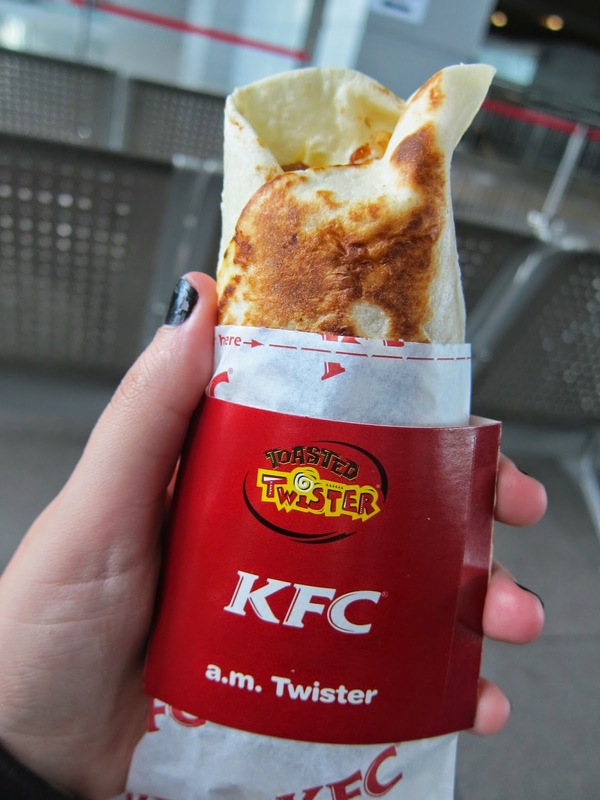 The next item I sampled was the Chicken Twister, which is like a breakfast burrito. Tortilla, fried chicken, cheese, tomatoes, and spices. It was also one of the best burritos I have ever had. Guess where I will be eating breakfast from now on?